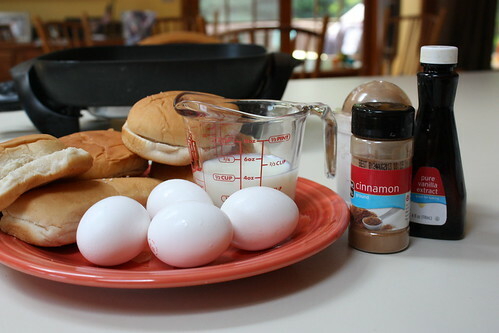 Wondering what to do with leftover hamburger and hot dog buns? May I recommend French Toast sticks? Yummm! 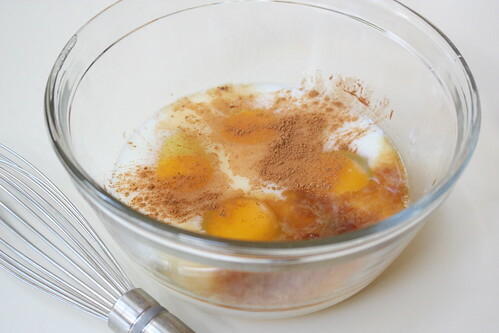 Sprinkle with cinnamon & sugar. Serve immediately or freeze**. P.S. My kids didn’t even need syrup! But you could also add it to the dipping mixture for a little maple flavor. 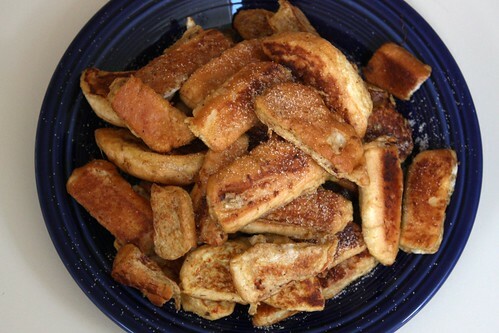 * I always have some cinnamon and sugar mixed in my Pampered Chef shaker to use on toast. ** To freeze, lay a piece of wax or parchment paper on a flat pan. 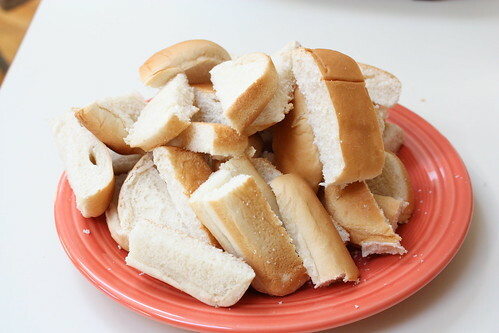 Lay single layer of bread sticks on paper. Freeze for 1-2 hours. Transfer sticks to a plastic zipper bag or freeze-safe container. May – What’s for Dinner? Add flour, salt and pepper to large Ziploc bag. Add chicken to bag, shake to coat. Add oil to large skillet and heat. Add chicken and cook for 5-7 minutes on each side until brown. Add sundried tomato pesto and chicken stock to the pan. Cook until chicken is cooked. I got this one at a recipe exchange at work. But by all the specific kitchen gadgets, I am fairly certain this is a Pampered Chef recipe. Yummy Recipe. Super easy. Super fast!! Combine beef, seasoning mix and salt in *10 inch skillet. Cook over medium – high heat 8-10 minutes or until beef is no longer pink, breaking beef into crumbles using Mix N Chop. Add enchilada sauce, water and salsa to skillet. Bring to a simmer and remove from heat. Arrange half of the tortillas evenly over bottom of Deep Dish Baker; top with half of the beef mixture and half of the cheese. Sprinkle 2 tbsp of the cilantro over cheese. Top with remaining tortillas, beef mixture and cheese. Microwave baker on HIGH 3-5 minutes or until cheese is melted. Garnish with remaining 2 tbsp cilantro. Serve with sour cream and lime wedges, if desired. Fold a 24-inch length of foil in half lengthwise. Fit into the bottom and up the sides of a 5–6-quart slow cooker insert. Put the turkey, bread crumbs, cheese, onion, egg, oregano, salt, and pepper in a medium bowl; mix with hands until well combined. Shape the mixture into a loaf and place on the foil in the slow cooker. Cover the slow cooker and cook until the meatloaf juices run clear or an instant read thermometer inserted in the center of the meatloaf registers 165°F, 3–4 hours on high or 6–8 hours on low. Combine the ketchup, sugar, Worcestershire sauce, and mustard in a small bowl. Spoon the mixture over the meatloaf, spreading it smooth. Cover the slow cooker and cook until the glaze is heated through, about 30 minutes longer. With the help of the foil, lift the meatloaf from the slow cooker and transfer to a platter. Discard foil and cut the meatloaf into 6 slices. Yields 1 slice meatloaf per serving. A Weight-Watchers Recipe. Very delicious. Great Flavor! Super easy to make! Preheat oven to 425°F. Coat a 9- X 13-inch baking dish with cooking spray. In a large bowl, whisk together mustard, oil, paprika, salt, thyme and pepper; add potatoes and stir to coat. Transfer potatoes to prepared baking dish and roast 15 minutes; stir and roast until tender on inside, about 15 to 20 minutes more. Yields about 1 1/4 cups per serving.